Parents in Zimbabwe who cannot afford school fees can offer livestock such as goats or sheep as payment, a government minister has said. The country's education minister Lazarus Dokora told the pro-government Sunday Mail newspaper that schools will have to show flexibility when it comes to demanding tuition fees from parents, and that they should accept not only livestock, but also services and skills. "If there is a builder in the community, he/she must be given that opportunity to work as a form of payment of tuition fees," the paper quoted him as saying. Some schools are already accepting livestock as payments, the Sunday Mail reports. A ministry official clarified Dr Dokora's comments: "Parents of the concerned children can pay the fees using livestock. That is mostly for rural areas, but parents in towns and cities can pay through other means; for instance, doing certain work for the school." It follows a move last week where Zimbabwe allowed people to use their livestock, such as goats, cows and sheep, to back bank loans. Under legislation introduced in parliament this week, borrowers would be allowed to register "movable" assets, including motor vehicles and machinery, as collateral, the BBC's World Business Report said. According to the Bulawayo24 news portal, Zimbabwe's worsening cash crisis means that people frequently spend hours queueing at banks to withdraw cash. The government says the shortage is due to people taking hard currency out of the country, but critics say it's due to lack of investment and rising unemployment, Bulawayo24 says. 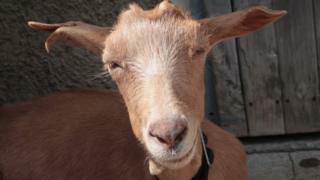 Social media has met the goats-for-fees idea with a mixture of scorn and gallows humour. Zimbabwean novelist Tsitsi Dangarembga tweeted "If we had been told in 1970 'We are fighting to introduce cattle and goats as currency. Please help & die for this' what would we have said? "; while another Twitter user - recognising the fact that not all farm animals are born equal - asked "Can I get a job as a goat evaluator?"